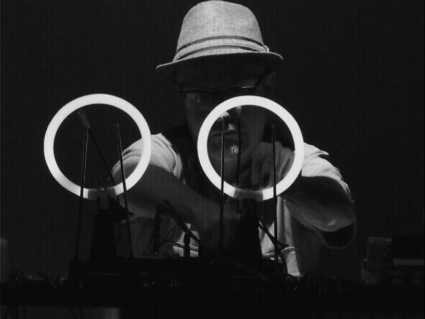 Exonemo, the Japanese duo made up of Sembo Kensuke and Yae Akaiwa, have developed several experimental works ranging from sound and video processing, software programming, hardware circuit bending, installations as well as live performance. With enough crossing over, exonemo continue to blur the lines of discipline and if you ask them whether they are designers, programmers, visual or media artists, you’ll find they don’t really care. 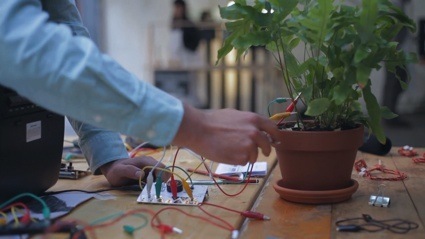 The concept driven circuit tweakers have reanalyzed the contexts of computer programming and investigated a new potential of the internet, making it their primary platform. 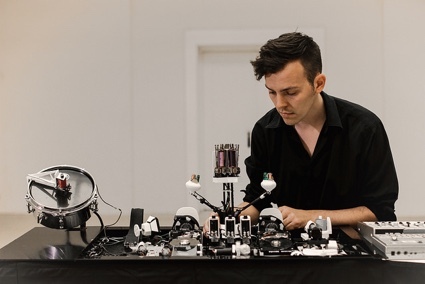 As a result, exonemo has created new consequences of hardware and soft technology and their work serves as a lasting commentary on our evolving relationship with technology- whether that be a sense of alienation or [dis]connection. Exonemo’s inviting DIY style and rising popularity have led these two rebel programmers to be often considered the new face of Japan’s media art scene. WMMNA had a chance to catch up with Exonemo right before their performance of Exonemonster, a mix of forgotten electronic instruments revitalized with a mind of their own, at the Centre Pompidou in Paris on October 4th. I heard you were just in China, what was Exonemo doing there? We just exhibited Fragmental Storm at an art gallery called Long March which was in the Art District in Beijing (798å¤§å±±å­?è‰ºæœ¯åŒº) from September 25th until October 22nd. Now you’re off to France, what will you be doing there? We are going to have another exhibition and have a live performance of Exonemonster, a device we created, at the Centre Pompidou in Paris on October 4th. For live information, you can check in-famous. Can you tell us about Exonemonster? Exonemonster is a musical instrument which has several other musical instruments fixed on a board with nails. All of the instruments have had their circuits bent. 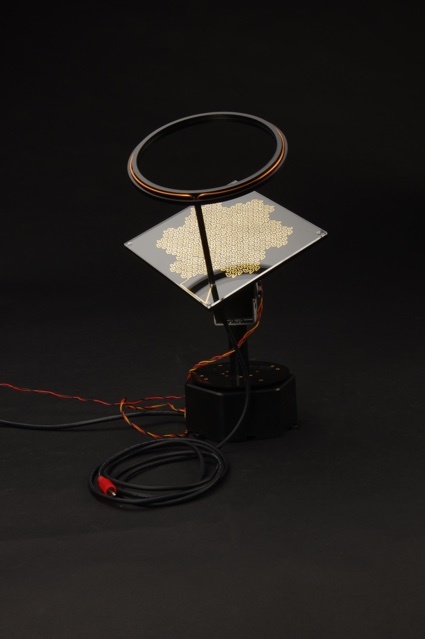 Its not just a musical instrument but also an object with naked circuits, nail and switches. With Exonemonster, we can play a variety of unpredictable sounds by wiring these circuits to each other and as a result, overdrive them in a somewhat complicated way on stage. So, where did the idea come from and why did you make it? I think it was probably after going to a lecture on Max/MSP (software) or Supercollider software. 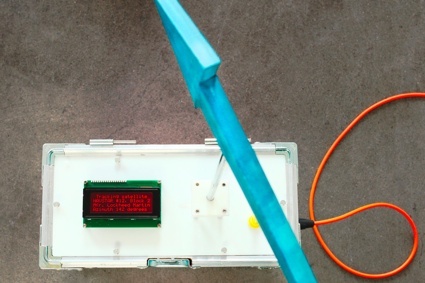 Max/MSP, can produce sounds by wiring digital objects. So after hearing about that, we decided we wanted to make a kind of free-play system that would be based on analog wiring; and we were twisted enough to decide to use analog while others were focusing on using laptops. So after that, we started working on an instrument with bent circuits. We used it as a Max developed object and fixed it on a board with nails and connected the instruments with clips to change the sounds. We were trying to get closer to the idea of Outsider Art by approaching it in a subjective way, not an objective way and so, because the sound of exonemonster is uncontrollable, so too, we made its appearance ‘uncontrollable.’ Then it became a monster that we can’t even control anymore. When we play or perform with exonemonster, it always surprises us. Now, we’ve come to develop a little bit of affection for it, as if it were a real friend. How important is interactivity in your work ? I’m not only thinking of exonemonster but also rgb-f__cker or remixhibition=>reactivity. Are you trying to make some kind of tools for people? I think interactivity is something like a ceremony that connects our work and the audience. When we approach a project, if interactivity is necessary, we implement it, and if it isn’t necessary, we don’t consider it in the project. For example, ZZZZZZZZapp has no interactivity once it starts. DanmatsuMouse is basically an exhibition you can see, but I think its better if the audience can feel the reality. Some of your interactive software works are downloadable (Discoder). Whose work is it? Exonemo’s or the user’s? The part that the user created with our work is the user’s work and the program they use to edit the work is ours. But I think a whole new experience is made by mixing both sides, so I can’t exactly tell who’s work it is. Most of your work explores the relationship between people and technology, why did you decide to explore and work in this direction? I don’t really think about it in terms of that direction very much, but I do think everyone gets really excited when technology and people meet. It’s interesting- people seem normal at first but then turn into animals and totally change their behavior, it changes our behavior. Its like, if it weren’t for mobile phones being so popular, if a man talked to himself walking down the street, it would seem like he’s crazy but because he’s cellphone’s are a common technology its OK. I think such a point is interesting. Well, do you think people today are disconnected from technology? No, not at all, there’s so much technology available and released on the web that you can get so much for free now. So, which is more important for you, reaching users individually with personal, interactive software or as a group with public installation or performance? Well, for us, these two aspects make for completely different experiences so we try to do different things when we produce for the internet or for an installation. But at the same time, the line’s been blurred and we have works that people can experience both ways, like the Road Movie. Both channels are important for us. Yes. and about using the internet in your work (Fragmental Storm, Discoder-Discoder), what is the internet for you? Information? A canvas? A place? I think its a place like a ‘park.’ Where people can come and go freely. Where do you think the internet is going? Well, its in the hands of the people so it’s going wherever there are people’s desires, it’s unlimited! And from here, where is exonemo going? Well, we just finished DanmatsuMouse which we created this year and we have had many exhibitions and performances recently so want to try a different work flow and wait until the next idea comes to us. Next, we want to do something on the internet. We’re thinking of something like a website to remix and play with our works ourselves. Its not really a work, per se, but something more like an environment. Thanks for making time for us Exonemo, we look forward to seeing and playing with whatever you come up with next! Posted in art from japan, installation, interview, performance, sound. Bookmark the permalink.